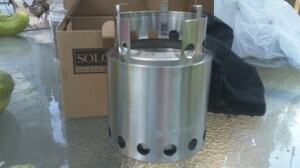 I was recently contacted by the folks at SoloStove.com about testing out one of their Solo Backpacking Stoves. Of course I said “Yes!” and within days arrived at my door was a small cardboard box containing the stove. Upon initial inspection the fit in finish was immaculate. I deal with Quality Control in my regular job and am used to looking at things with great detail. I was pretty impressed. Additionally, I was surprised at just how light the stove was at only 9 ounces. The stove is in two pieces plus a lightweight carrying case. 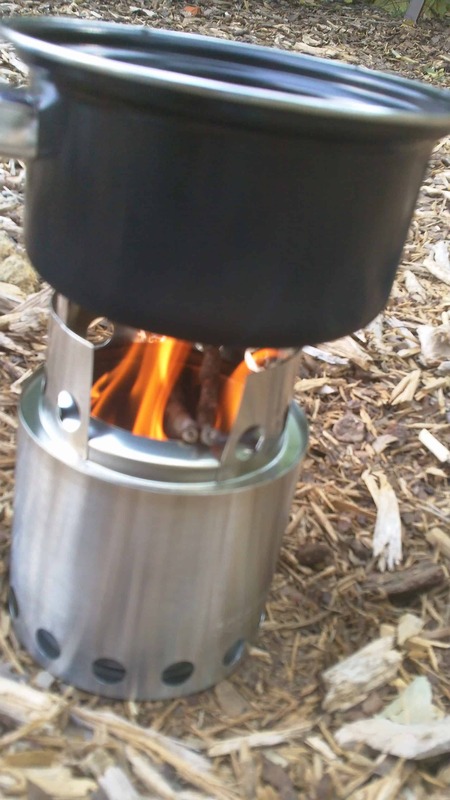 The bottom piece is the base which holds the fuel and the top piece – which fits inside the base during – extends out the top to hold a small pot or pan. 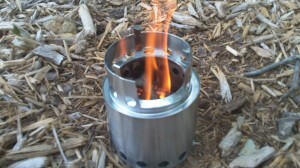 The Solo Stove works on the same principle as a rocket or volcano stove. Basically wood fuel is burned within the base. At the wood burns and heat rises air (oxygen) get sucked in through the bottom holes of the base – feeding the flames. This allows the stove to burn hot to lessen cook times. To test the stove out I gathered a small pile of dry twigs and sticks. For tinder I used a packet of dryer lint in the bottom of the base. 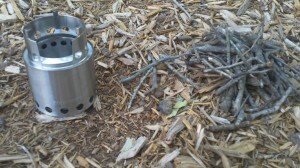 Placing a few twigs above the lint making sure air can flow through the stove – I lit it. You can see from the picture above the Solo Stove going. On the front of the top insert is an open space. 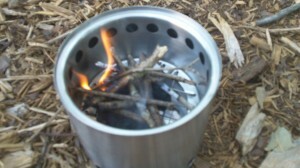 This space provides an opening which to drop more fuel (small twigs and sticks) while cooking. I boiled some water to see how easy it was. I used a small pot containing two cups of water. 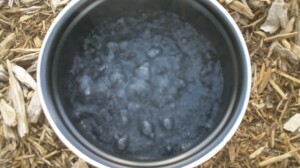 Within about 5 minutes the water was at a rolling boil (see below). Success!! Honestly – this was very easy. Overall Impression: Very positive. Lightweight. Easy to use. Portable. 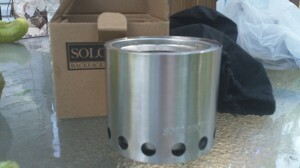 I am certainly incorporating the SoloStove into my survival system. Great for a bug out bag. Negative? Hard to find. Rain can certainly have an impact on cooking. I find this piece of equipment to be a great value. I won one from “total libertarian rantfest” , and have been nothing but pleased. You would be hard pressed to find a better Bob stove, or just a backup cook stove for the house.